The National Genealogical Society (NGS) is pleased to welcome Angela Packer McGhie, CG, as its education director and Liz Stratton, PLCGS, as its administrative course manager. They succeed Julie Miller, CG, CGLSM, FNGS, who has ably served as the interim education manager since March 2018. 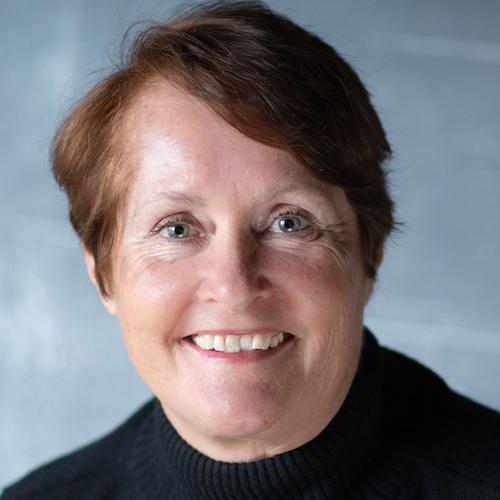 McGhie has a background in secondary school education and is a board-certified genealogist, author, and lecturer who brings ten years of genealogical education experience to her new position. McGhie wrote the curriculum for the ProGen Study Program, served as its administrator (2008–2014), and is now on the board of directors. The ProGen Study Program guides aspiring professional genealogists to develop genealogical writing and business skills. McGhie has developed numerous genealogy institute courses including for the Institute for Genealogy and Historical Research and the Salt Lake Institute of Genealogy. She also served as an instructor for the Boston University Certificate Program in Genealogical Research and for Howard Community College. Stratton holds a Professional Learning Certificate in Genealogical Studies (PLCGS) from the National Institute of Genealogical Studies and is a regular attendee of genealogical institutes and conferences. She served as a GenProof mentor (2013-2016) and ProGen coordinator (2010-2012). She is the recent past-president of the Association of Professional Genealogists (APG) Virtual Chapter, for which she developed monthly educational programs. During her tenure as Education Director of the Hamilton County (Ohio) Genealogical Society, she developed three, interactive education series and started the Advanced Genealogy Forum. We look forward to our members meeting Angela and Liz at the NGS Conference in St. Charles, Missouri, in May 2019. Season's greetings from the NGS Board of Directors and NGS staff. 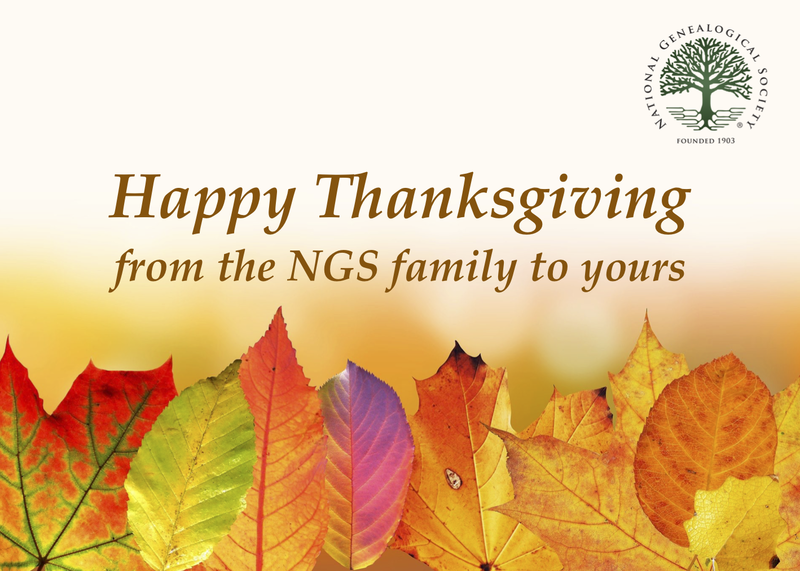 ‘Tis the Season of Giving and in the spirit of giving NGS has extended its deadline for enrolling in the Salt Lake City 2019 Research Trip to 27 December 2018. Why not share your love for genealogical research with someone you love and invite them to join you as you explore the world-renowned Family History Library in Salt Lake City, Utah, from 27 January to 3 February 2019? 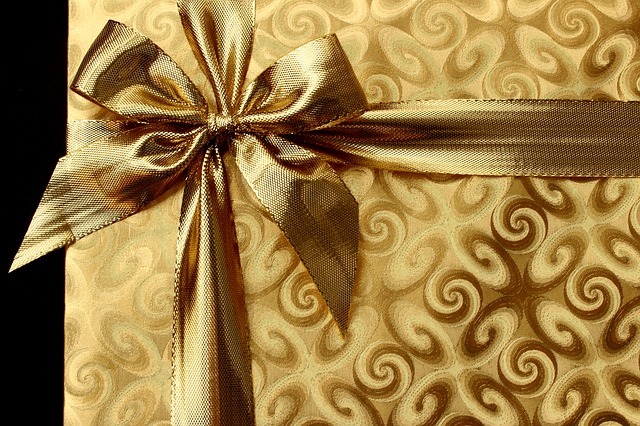 Other great gift ideas include purchasing a year’s Membership in the National Genealogical Society for a friend so he or she can take advantage of all our member benefits. You also can use your Membership Discount to purchase gifts for friends and family including books from our Research in the States series and skill-building books that cover topics such as genetic genealogy and genealogical documentation. There are many educational courses to choose from too. 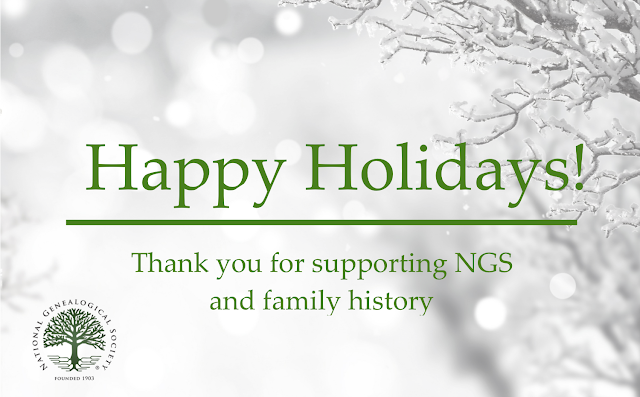 Or relax over the holidays and take some time to cruise around our new website for genealogy guidance, or take our newly revised and updated free Family History Skills course, a benefit of your membership. The deadline for submissions for both the awards and competitions is 11:59 PM, 15 December 2018. 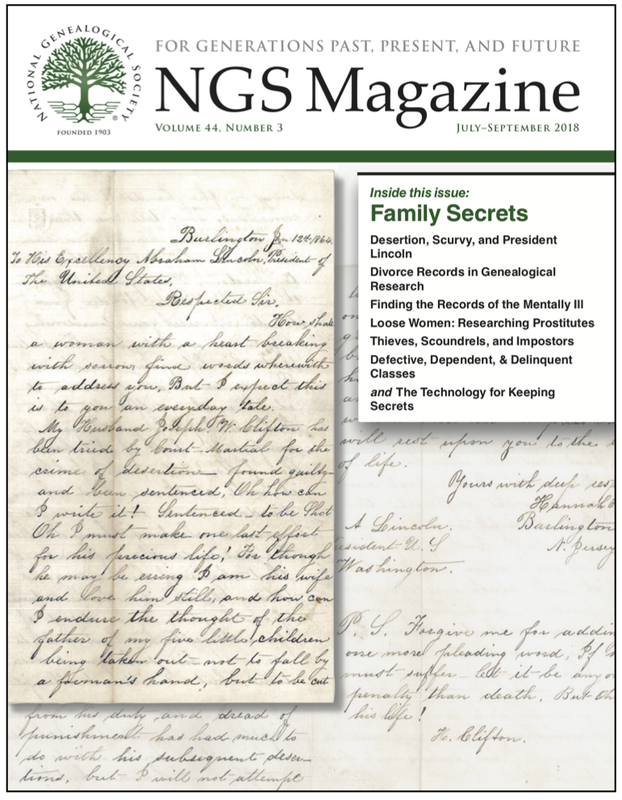 NGS believes that outstanding work in the field of genealogy—indexing and digitizing records, creating free websites and webinars, writing articles, lecturing, chairing conferences, blogging, leading special interest groups, and creating communications and newsletters—deserves national recognition. We encourage you to nominate a genealogist or organizations or submit your own work to the NGS 2019 Awards and Competitions. 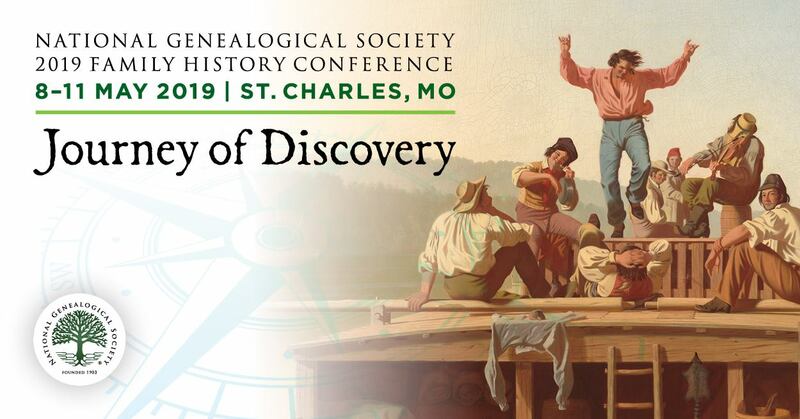 Winners and award recipients will be recognized at the NGS 2019 Family History Conference, 8-11 May 2019, St. Charles, Missouri. Complete details and all necessary forms can be found at the NGS website. All nominations must include email contact information for nominees and the persons nominating them. Send nomination forms by postal service or email. 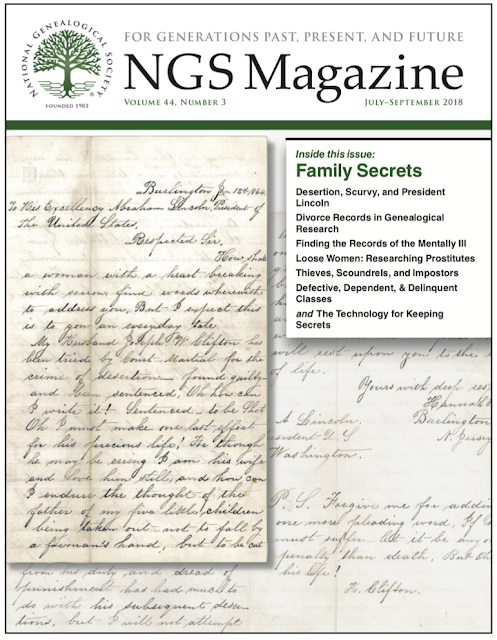 The July-September 2018 issue of NGS Magazine, Volume 44, Number 3, has been mailed to members and is available online in the Members Only section of the website. Every family has its secrets—scandalous, tragic, embarrassing, or just different. This issue deals head on with some of these skeletons in the closet and the unusual techniques and records that may reveal them. Sydney Cruice Dixon discovered a long-hidden family secret in the National Archives. Her case study examines the reaction of two communities to a Civil War court-martial and its long-lasting effect on a family, and introduces the use of genograms to chart patterns of behavior in family history. Divorce in earlier generations is seldom disclosed, although it has been part of American culture since the seventeenth century. 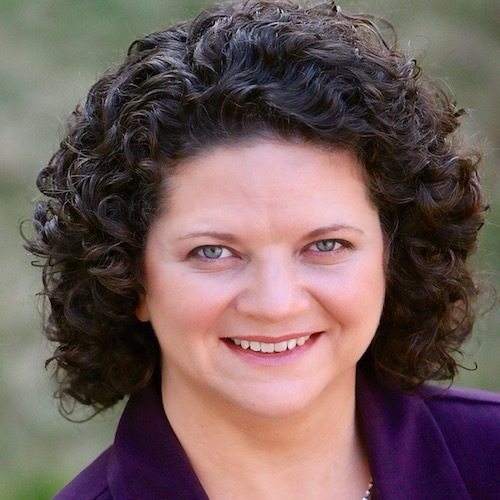 Pam Stone Eagleson, CG, provides a comprehensive range of clues that a divorce occurred, examples of using indexes, and ways to locate records. Genealogists may want to know more about mentally ill ancestors but have low expectations about obtaining access to their records. Jill Morelli, CG, explains what is available publicly, where records may be held, and how to obtain state-held records when restricted by law. Some female ancestors who “disappeared” may have become prostitutes. Jane Haldeman demonstrates how an understanding of local and federal laws and the challenges prostitutes encountered can help with researching ladies of ill repute. Unscrupulous people took advantage of Civil War pension laws to obtain money under false pretenses. Claire Prechtel Kluskens gives examples of scams and highlights a National Archives collection that is being digitized. The 1880 Supplemental Schedules for Defective, Dependent, and Delinquent Classes name thousands of people affected by blindness, child homelessness, deafness, imprisonment, insanity, mental disability, and poverty. Kathy Petlewski outlines the contents, purpose, and locations of these schedules. Jordan Jones discusses methods of physically and logically securing private information and ways to share data cautiously, with warnings about the sensitive nature of DNA data and evolving privacy laws. 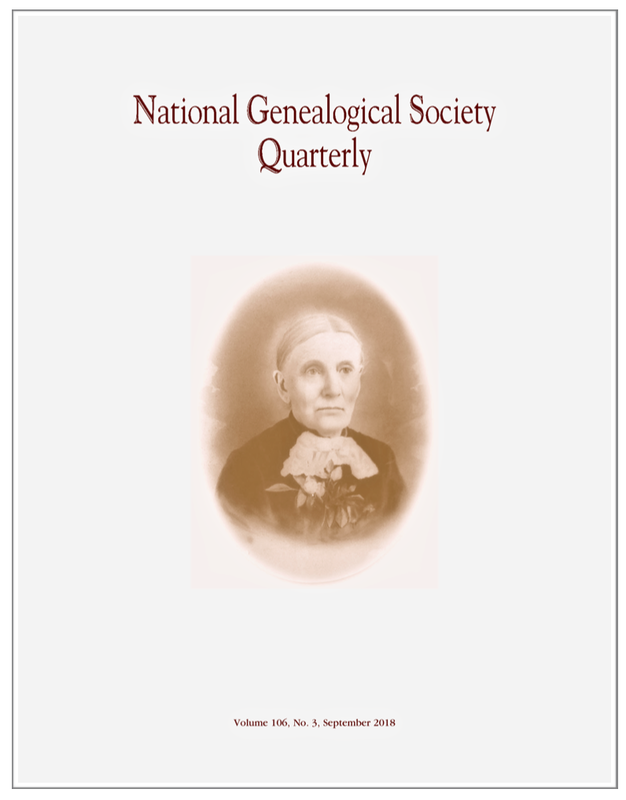 The September 2018 issue of the National Genealogical Society Quarterly, Volume 106, Number 3, has been sent to the printer and will be arriving in members' mailboxes. 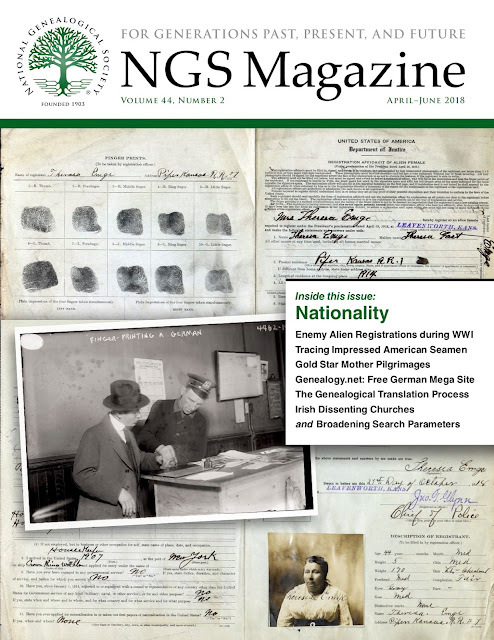 Members can access the current issue at the NGS website (log in required). 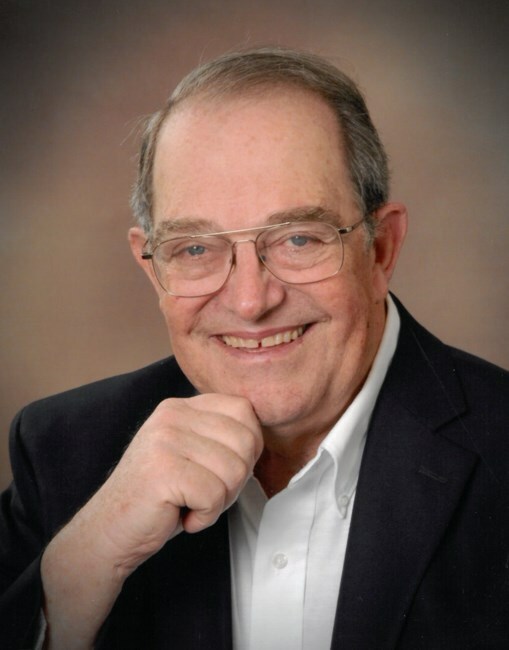 The National Genealogical Society (NGS) has learned of the passing of Russell Henderson. Russ was the former editor of the NGS NewsMagazine and performed many other important administrative tasks for the society. He was an excellent genealogist and a kind and giving colleague. NGS extends its deepest sympathy and condolences to Russ's entire family and his many friends. Mr. Henderson's obituary was published at https://www.dignitymemorial.com/obituaries/alexandria-va/russell-henderson-7973290. The 2018 Federation of Genealogical Societies Conference #FGS2018 starts today in Fort Wayne, Indiana, August 22–25. 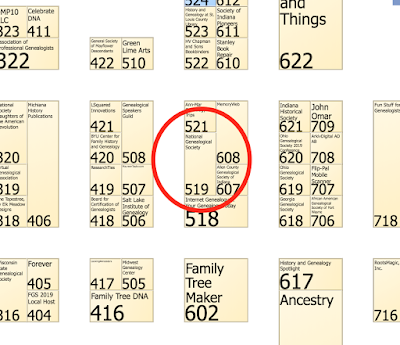 If you are attending, be sure to stop by NGS booth #519. The hours at the vendor hall are Thursday: 10:00 a.m. – 6:00 p.m., Friday: 10:00 a.m. – 7:00 p.m., and Saturday: 10:00 a.m. – 4:00 p.m.
Susan and Julie will be staffing the booth—visit and learn about upcoming NGS conferences, new courses, publications, planned research trips, and more. Saturday, 25 August 2018: Choice of one book from the Research in the States series. 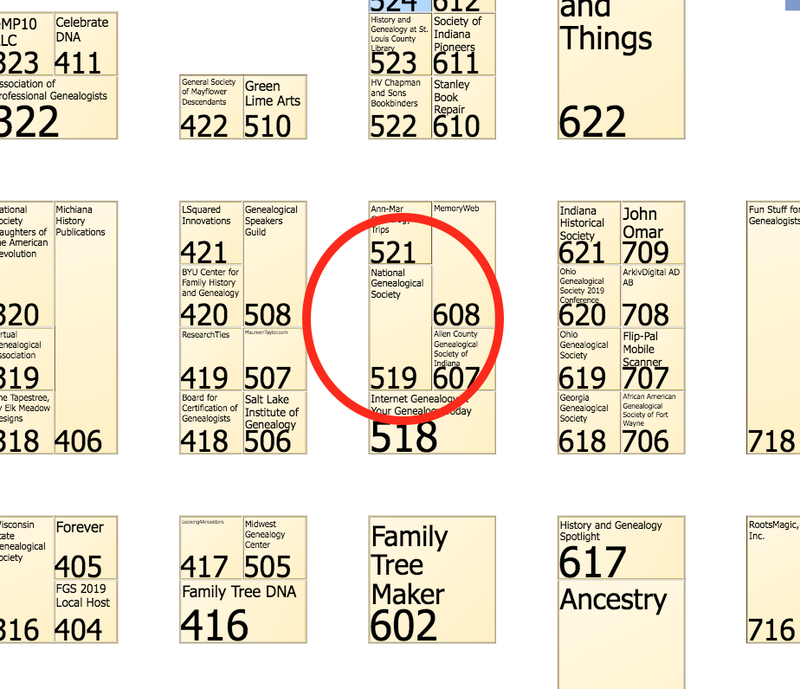 See you in the Exhibit Hall at Booth 519! NGS offers attendees several discounted hotels, convenient to the convention center. Embassy Suites St. Charles is the conference hotel and is connected to the 2019 NGS conference center site. Other conference hotels offer a variety of room rates, free parking, and internet service. Most offer free breakfast each morning. When making a reservation, be sure to ask for the 2019 NGS rate. Seven hotels, within a two-mile radius of the conference site, will have a complimentary shuttle service to the SCCC. Two additional hotels are a little farther away and do not offer shuttle service. Uber and taxi service are also available. Since past experience has shown that conference hotels tend to fill quickly, early reservations are recommended if you intend to register and attend the conference. The hotels are offering the NGS rate three days before and three days after the conference, based on availability, so participants can do research or go sight-seeing in the area. Please check the hotels’ websites for cancellation rules and for additional amenities. Full details and links for NGS discounted, online reservation can be found on the NGS conference website. St. Charles has a small-town feel and friendly people. Come early or stay after the conference and take a day trip to wine country, tour the Foundry Art Centre, and dine at a variety of restaurants and breweries. To learn about area research facilities for family history, several of which offer national collections, refer to the conference’s Announcement Brochure on the NGS conference website. The four-day NGS 2019 Family History Conference promises to be a great opportunity for family historians to advance their research, hone their skills, and network with fellow genealogists. Be sure to reserve your hotel accommodations as soon as possible.